2. What German company puts this logo on its vehicles? 3. You might think his biggest hit was "If I had a Boat," but the truth is he's never really had a "hit" single per se. His career has been interrupted when he was gored by a bull, and he used to be Mr. Julia Roberts. Who is the man with the large band? 4. This blue mineral's popularity is pretty enduring; it has been mined in the Badakhshan province of Afghanistan for more than 6000 years. 5. Sometimes this term is thought to just mean any kind of fat, but it is actually "a broad group of naturally occurring molecules which includes waxes, sterols, fat-soluble vitamins, monoglycerides, diglycerides, phospholipids, and others." 6. Name the countries! Indicating which is which! Chop chop! 7. "Perhaps fifteen of his paintings survive, the small number due to his constant, and frequently disastrous, experimentation with new techniques, and his chronic procrastination." Yet, "he is widely considered to be one of the greatest painters of all time and perhaps the most diversely talented person ever to have lived." Who is this fiendishly clever dude? 8. It's the capital and largest city of Slovenia. It has j's in its name! 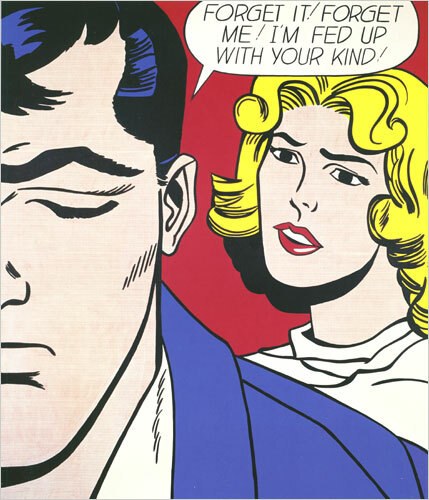 9. Who is the painter who is famous and considered important, despite that this sort of thing is typical of his work? 10. He survived two assassination attempts in 1918, but his health never recovered and, after a series of strokes, he died, apparently with grim misgivings about his successor, in 1924. We refer of course to _________. Put your answers in the comments on your pony on your boat. 6. 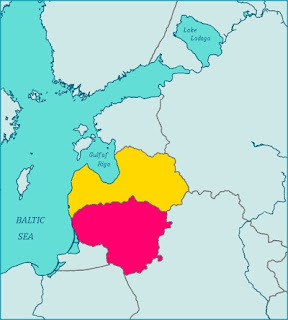 Latvia (red) & Lithuania (yellow). Or maybe vice versa. 6. Latvia, Lithuania, with an Estonia on top. Lithuania is the one in pink, I think. 9. (L-aomebody, but I can't even come up with a good L-word.) Livengood! Lawrence! Lechleitner! Neigh, no can do. Alas, lacking a boat. 6 Lithuania and Latvia! Now, which is which? I'm so embarrassed. Lithuania is...yellow? 10 Mickey Mouse? Oh, Lenin. 4. The only one I can think of is labradorite but that's the wrong continent. No, wait! Lapis lazuli is the answer. 6. Lithuania and lower Lithuania? 8. Ljubjana or something like that. 9. Lichtenstein? or is that how you spell the country? Roy is his name. 10. One of those damn presidents I'll bet. There's no "of course" about this one. 2. Lufthansa, strong drinks and fresh apples! 5. you make it all sound so yummy, are they lipids? 9. Frank something? The Sin City guy? 5. Lipids - matches the description, but having the morpheme in the question might make it too easy. 6. Latvia (yellow) & Lithuania (pink) - rode my bike through both countries. The latter has the worse roads and drivers. 8. Ljubjuana, possibly with a ĉ, except the other way up, in there too. 9. Lex Luthor - Look if it isn't Rembrandt or Warhol, don't ask me art questions. 10. V.I. Lenin, unless it's someone else. My boat has a pony? 1. Lady Macbeth. One wonders what her parents taught her. 2. 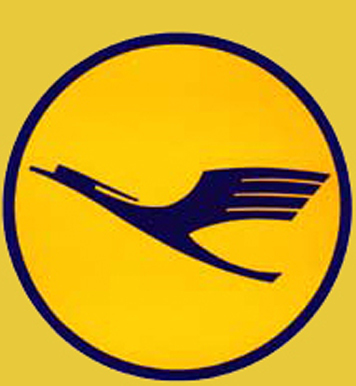 Lufthansa --illustrious member of the Star Alliance. 5. Must be lipids -- but the fat-soluble vitamin thing is new to me. I thought all vitamins were proteins. Schooled! 6. Latvia is yellow, and Lithuania is pink. 7. Sounds like Leonardo da Vinci. 9. Not that Michael is judging, no not at all. Little trick about the Baltic States? Alphabetical order, north to south.